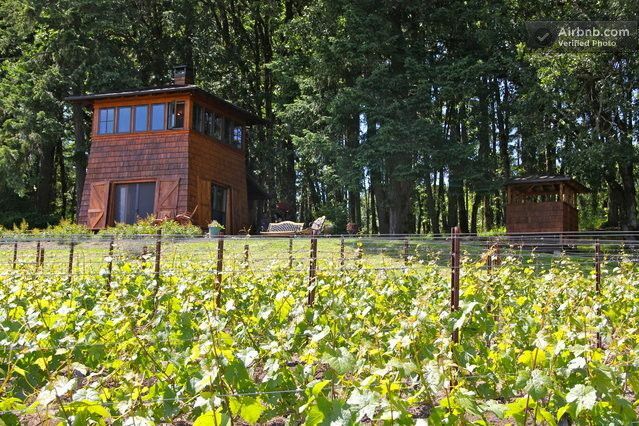 The Beacon cabin is a simple but sophisticated cabin w/spectacular vineyard views nestled in the heart of the Willamette Valley. The Beacon Cabin is truly a one-of-a-kind, perfect for couples or anyone looking for a tranquil setting to meditate, read, wine taste, hike or just relax and take in the views! Plush Queen size bed with luxurious bedding! Go on a stroll along the vineyard rows and take in the fresh air! There is Uber available, but it depends on the time of the day in which you are requesting a ride. Getting to the property is easy with an Uber. If you are wanting to Uber from the Cabin and out into the town, please allow 15-20 minutes to get picked up from the property. Enjoyed the experience of staying in a cabin located at the vineyard Great views of the vineyard and countryside from deck. Waking up in the second floor bedroom with 360 window views one of a kind experience. I would highly recommend this cabin! In the heart of Oregon wine country and close to amenities, this cabin was perfect for two! Beautiful views of vineyard, mountains, ponds, and farms. The bedroom loft offered us a 360 degree view and it started our day off right. Loved sitting by the fire, sipping wine and eating fresh seafood from the grill. Nice and quiet retreat and very clean. Owners even provided us with a bottle of their wine, bagels, and a nice note. Nice touch. Be sure to check hours of wineries in the area. We traveled after Christmas and before New Year’s and some were closed, but still plenty to choose from and enjoy. This property is absolutely stunning. The setting between woods and vineyard are a beautiful balance. The home was furnished perfectly and the bedroom felt like you're sleeping in a treehouse. We could not have been happier with our stay and would return here in a heartbeat! My husband and I enjoyed a delightful few days at this beautiful property. Sitting on top of the hill, the cabin offers unobstructed views of the vineyard and surrounding area. We loved the privacy as well as the peace and quiet. Carla was incredibly gracious and welcomed us with a fabulous bottle of wine from their Beacon Hill Vineyard, fresh bagels and cream as well as orange juice. The handwritten welcome note was a special touch. Although small and rustic, the cabin offers everything one would need. We are already planning our next visit and would highly recommend this lovely little gem in Oregon's wine country. This was our second stay at this cabin. The view is stunning. Bed is very comfortable, kitchen is well stocked and bathroom has a great shower. It's very quiet. We tend to go out for lunch/tastings and have dinner at the cabin so we can enjoy the view with a glass of wine. Carla is super nice and very responsive. Will stay here again for sure! Our 2nd time staying at the cabin and loved it yet again! The views are just amazing and such a great location, yet feel so private when staying here. We will likely be back for a 3rd time here in the future! I would highly recommend. The Beacon cabin is in its own private world, but still within reach of all the major attractions. Only a 5-10 min drive to major wineries: WillaKenzie Estate, Penner-Ash, Solena, Soter Vineyards, Shea Vineyards, and lots more!